The history and love for the German Shepherd breed - Someone wanted to destroy this pretty white puppy. The first I had ever even seen or knew of a white German Shepherd was in July of 1976, An ad was placed in a local paper for a black and tan male. When I arrived at the breeders home they had kennels as far as the eye could see, all different colors of German Shepherds, Silvers, Tans, blacks. I loved all animals especially dogs and especially The German Shepherd, I began to walk around and look at each dog trying to decide how could anyone pick one from another , they were all beautiful, I wanted them all. My eyes looked to the right and left and in the back of one of the buildings I noticed a cage sitting by itself , the puppy in that cage was a little different looking than the others, he looked like a German Shepherd but as white as snow, ears stood tall and erect, he was beautiful. I thought perhaps the dog was a white wolf or a Eskimo dog, He looked so similar to the German Shepherd , I could hardly take my eyes off of him. He was beautiful!! , pure white as the whitest of a snowfall as I walked closer I noticed he had black trimmed eyes, a black nose , a beautiful face. He was licking the cage to get to my hand. In the two seconds it took to look at him, he already captured my heart. The breeder was watching from the other kennel where the tan puppy was she yelled over to me, he was not for sale. When I walked to her she began to tell me he was not a quality German Shepherd, he was a miss fit from a pure bred Litter of Puppies, a throwback and had scheduled him to be destroyed when the vet arrived later that day. At that time in breeders miss information on the white German shepherd dna they were thought to be a dilute to the color, a throw back and most all were put down. That started in Germany with the reign of Adolph Hitler. At that time in history little if any research had been done to prove that theory false. 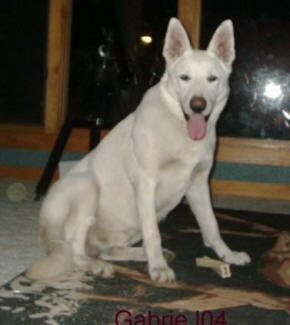 In lake of information and ignorance other countries soon followed suite, all the white shepherds were mass destroyed. My heart felt for that beautiful White puppy, I pleaded with the owners to let me take him home , finally with tear filled eyes they agreed as long as I had the dog fixed so it could not produce. He was one of the best dogs I had ever had the pleasure to own, he was a smart, friendly, social and very beautiful dog, he had kind disposition unlike any German Shepherd I had ever owned. That began a long life and love for the White German Shepherd , As time passed on I fell more in love with the breed and continued with the White German Shepherds, when I told my family I had purchased a White German Shepherd and the events surrounding the dogs, I learned that they had owned and bred White German Shepherds some many years ago, i had no knowledge that these dogs even existed so to my surprise they were meant to be found again, I was meant to love that puppy and today the Sire of all my Puppies is one of my best Friends, If you have been to our home you know him well. He has sat on your lap or tried to stand close to you for a simple pet, he has walked with you around the fields looking at the horses, his name is Gabriel. He is one of the sweetest, gentlest, most intelligent companions a person could ever hope to have. I kept my love for the German Shepherd for my life time , With the help of the internet and research into the dna , The world has since been educated to find the white German shepherd was and is not a dilute gene and in fact was an original color of the founding parents of the German shepherd dog we know today. read entire story here They made wonderful pets with children and other animals. Our farm was located in Princeton IL for many years until two years ago when we moved our Appaloosa Horse Ranch to Missouri with our family. we are located in the Tourist Area of the Ozarks, Lake of the Ozarks , who love the Lake and the beautiful country side of the Ozarks.